I have/had a dedrobium phal. and sadly it started to decline. I kept this poor plant in its original pot and media it came in, because it was still in flower. I cut the flower spike and all the roots... I actually cut the mushy bit of the two leafless canes as well. 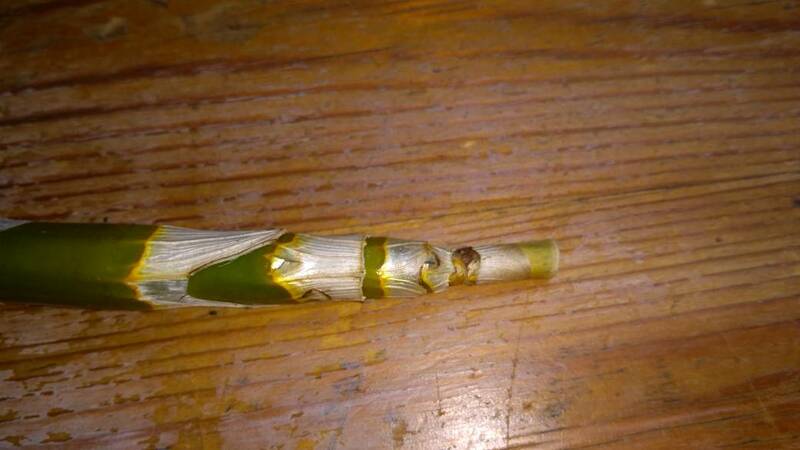 But one of the leafless cane started growing bumps and cracking as it is trying to push out something... I am hoping for some keikis... but I don't want to have my hopes too high. I will try to post some pictures of the cane in question. Thank you in advance for any help and advice, I greatly appreciate it! Here is a picture of the flowers... hope to see them in the future!!! You will possibly save either with new growth or keiki like said above. I think this is just too moist in winter that has caused this? They don't want to be too moist and cool in winter. Do you let it dry out? If you save it I wouldn't like to see it happen against next time. I bought this plant sometime early November in the local swedish furniture shop, it was in flower, also had another spike full of buds and I was waiting for it to finish flowering... Sadly didn't noticed in time that the bottom of the canes was rotting... Shortly after this one, I bought another dendrobium, that plant is thriving. When I finally repotted this plant, it had a massive ball of spagnum moss around the roots...Not sure what the rest of the potting media was, but it was very fine, peat moss type of material. I am very careful of my watering, especially in winter time... I was really sad when I saw this plant was in such bad shape. I had the bare canes in a jar with the spagnum moss, and was happy and surprised to see the little bumps... I moved them to a long plastic box, monitoring them carefully and hoping for the best. I find it really unethical that some people sell plants which clearly are unhealthy. Please don't give up enjoying this one, it has a chance but will take time. Yes, I would definitely try to save this orchid no matter how long it takes. I will post here updates on it's progress . The canes in the jar are doing well, new growth is appearing!!! Those in the plastic box are showing slow but steady growth as well... hope everything will go well! Congratulations! They are responding to your careful attentions. I am really happy they do! I am excited it is working! I was devastated for loosing a plant and by trying to save it I learned so much! I actually joined the Irish Orchid Soceity and I hope to learn more about how to keep my plants happy. I am also very grateful for all the information and support I am getting here! You’re showing great patience in getting your Den to rejuvenate itself. I have well over 100 Dens and hate loosing any plant. Nice thing about most Dens is that you can take a piece of the cane and lay it across moist Shoah and more often than not get it to form new growths. A long process for sure but it’s a good learning process. As Bolero said Dens like cooler temps, brighter light and less water in winter. I’ve got many that don’t see water for a couple months and even my Phal type Dens get a huge reduction in watering come winter. Thank you so much for the advice and encouragment!!! I love Dendrobium orchids, I wish to see your collection!!! I was prepared it will tale a good while until anything happens to my canes...actually I added a few more to the original ones, just to "recycle" them instead throwing away the old, lifeless looking roothless canes...and hey presto!